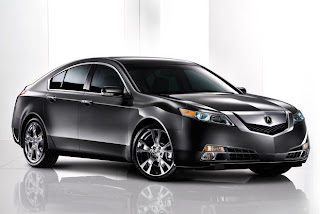 Acura has just announced that their all new 2009 Acura TL will debut this fall. The 2009 Acura TL sports a completely redesigned exterior and a luxurious interior plus it is available in two models: the Front Wheel Drive and an All-Wheel Drive. Acura's press release of the 2009 Acura TL is pretty sparse, there's not even a mention of what's under the hood but rumors have been going around in some auto blogs that the Front Wheel drive model will sport a 3.5L V6 Engine with 280 horsepower while the All Wheel drive has a 3.7L V6 engine that produces 310 horsepower. The Super Handling All Wheel Drive on the other hand, in order to distinguish it from the two lesser TL models, will have a quad-exhaust and 18 inch wheels. Watch out for the 2009 Acura TL this fall.